I was born in 1987 in Brno, Czech Republic. A spent my childhood in a nearby city Blansko, where I also completed my primary and secondary education. After I studied 5 years at the elementary school Dvorská, I transferred to the 8-year studies at the grammar school Gymnázium Blansko. There I became more and more attracted to natural sciences, especially mathematics and physics. I was so interested in these fields that I also tried to compete with other students at yearly contests. Although I wasn't particularly successful, the preparation for these contests greatly broadened my scope above the basic curriculum. As a leisure time activity, I was interested in computers - mainly hardware manipulation, system configuration, administration and some very basic programming. When the end of secondary school was getting closer, I competed quite successfully at the national science competition with my work on cryptology. This experience was actually my first contact with what is generally understood as computer science and quite honestly, I was very amazed by this science discipline. 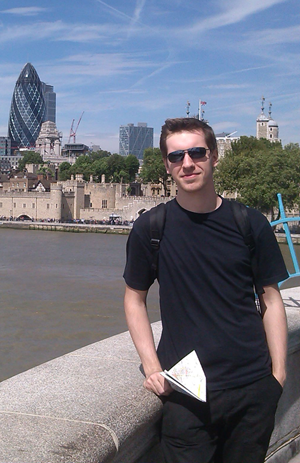 During this time, I also went twice to the scientific summer camp organized by Charles University in Prague. All the mentioned above heavily influenced my choice of university education. Without much hesitation, I enrolled to the computer science bachelor program at Faculty of Mathematics and Physics, Charles University in Prague. Studies were quite hard right from the very beginning, but I got used to it very quickly. I would say that first two years are the most intense owing to the fact that you have to learn basics of abstract mathematics, abstract informatics and practical programming all at once in a very tight schedule so you can build upon it later. Third year, I started to profile myself towards more practical side of informatics. I spent most of the time developing my own compiler and working on visualization tool for my bachelor thesis. During this time, I was also given a chance to participate on writing a scientific article and also in giving a short talk at the scientific conference, which was very interesting experience. After securing the bachelor degree, I enrolled to the follow-up master studies focused predominantly on various flavors of system programming. To diversify my knowledge portfolio, I also investigated area of data analytics and neural networks. Other than that, my master studies were a continuous flow of very challenging programming projects. At first, it was development of operating system kernel. Then, I was briefly employed by Google as part of their summer stipend program to port part of the existing compiler toolchain to the experimental operating system. After that, I started working on my diploma thesis, which was about designing and implementing a graphics subsystem for the already mentioned experimental operating system. In parallel with the diploma thesis, I also participated in the development of drug discovery tool for the purpose of compulsory team software project. This was a very important experience for me, because apart from programming itself I was given a responsibility to coordinate a team of developers and to control overall quality of the resulting product. Immediately after that, I was accepted to yet another summer stipend program. This time, I was employed by European Space Agency and my task was to optimize an existing tool for image analysis. After the project was completed, I focused on finishing my master studies, which I successfully concluded in May 2013. According to the Myers-Briggs psychological type indicator at MyPersonality.info, I match INTJ type (czech characteristics, english characteristics). 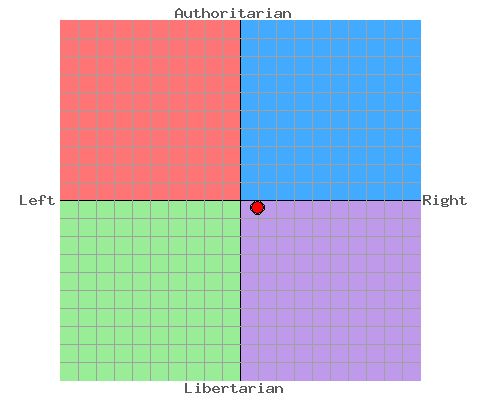 I tend to be conservative, as can be seen on the result of The Political Compass test. I am a member of Mensa Czech Republic since 2006. I played a transverse flute for 8 years (both solo and in orchestra). I like exotic cuisine, especially Italian and Japanese. I am a passionate drinker of Chinese dark pu-erh tea.